My OS X Hackintosh that I use as a home server has started behaving strangely recently, iTunes would stop responding, Plex would not work and sometimes I couldn't even log into the server itself. What I noticed was that Apps were being 'Paused'. This is how I resolved it. This is the kind of thing I would see when the Force Quite Applications window was opened. The app name is displayed in red with the word paused next to it in brackets. This was confusing me at first and initially I just force quit the affected apps, however a few days later the same thing would happen, so that was obviously not a solution. 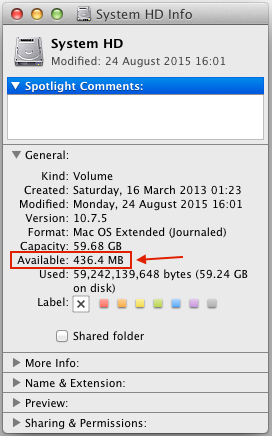 I had just over 430Mb on my System disk! I realised what was happening...as apps used more memory, OS X couldn't allocate any virtual memory due to lack of disk space so the app would just get paused. The solution? Make some room on the hard drive. It's as easy as that. I went through and removed about 20Gb of logs and apps I never used, as well as data files from long ago that weren't needed any more. 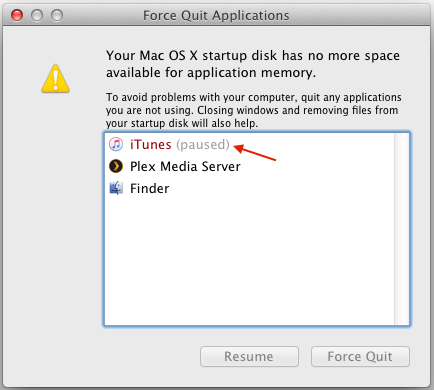 As soon as the extra disk space was available, OS X automatically unpaused the paused applications. There was no need to force quit any of the apps. Since clearing out the disk, I've not had any apps pause on me for several weeks now.